Monday through Saturday my alarm goes off, I pull myself out of bed and start the day by quilting for an hour. 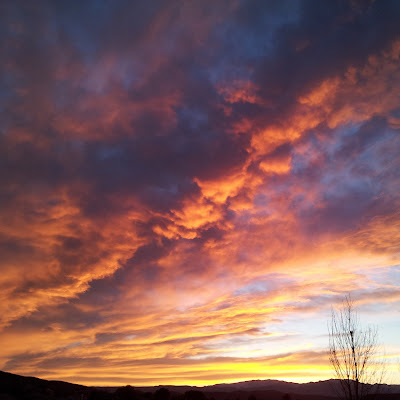 Then, I feed the kids, get the older two off to school - or get them started on chores - and each week I think I am going to be able to stick to my schedule and that everything will go according to plan, but there is always a catch. This little guy, for the most part, would not nap this week. I have a quilting schedule to keep while he is napping, but he doesn't know that. He just needs me. I give him the time he needs, and I am grateful that I do, but in the back of my mind I know I have a quilt that is waiting to be finished. More like I am ready to be finished with it so I can move on to the next project. So, I plan a "catch up day" - today, where I completely ignore the kids and quilt all day long. Clint and I are both trying to get what we need to done and the kids were crazier than ever - I think they can feel it when we are a little stressed - so they make sure they are extra loud so we are sure to hear them. I finished the background quilting today, and that was great - but I wanted to finish the whole quilt today. The hardest thing that I do is that I put crazy expectations on myself (and my family) when I think that I can just finish up a project on a Saturday. What I failed to realize was that there was no way I was going to finish this quilt today. There is just not enough time in the day - especially since the red thread is not wanting to cooperate - but I put this above the time I could have spent with my kids. So, I feel like I failed them today. I think the hardest thing for me is to realize that it is okay to finish later than expected. Everyone who reads this blog knows that I take forever on my quilts. But, I find myself adding more and more to my "to do" list and when I don't get to all those things on my list I start to think I am failing and not reaching my goals. Truth is, I have accomplished a lot of my goals, the book being the biggest accomplishment so far - but when is it enough? If I allowed myself to care more about my goals than the needs of my family, then I would lose out on what is more important. Days like today are always a reminder, or a kick in the pants, that get me back on track. I am one lucky wife and mom who has a husband who is patient with me and kids who love me despite my weaknesses. 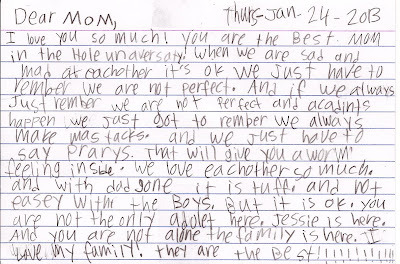 I have wanted to share a note that my daughter wrote to me a little over a month ago during one of my "Mommy moments." This note is one that I promised I would read to myself whenever I had a bad day. She wrote this note to me on a particularly bad day when Clint was in Romania and I was feeling like a lone ranger with a business to look over and 4 kids to keep track of. "Dear Mom, I love you so much! You are the best mom in the whole university. When we are sad and mad at each other, it's okay. We just have to remember we are not perfect. And if we always remember we are not perfect and accidents happen we just got to remember we always make mistakes. And we just have to say prayers, that will give you a warm feeling inside. We love each other so much and with Dad gone it is tough and not easy with the boys. But it is okay, you are not the only adult here. Jessie is here and you are not alone, the family is here. I love my family, they are the best." She is 7 and wiser than she even knows. I read this today and it made me feel better. I know that tomorrow is going to be a better day than today and I am so happy it is Sunday (no work, yay!) and I get to spend all day with my family. 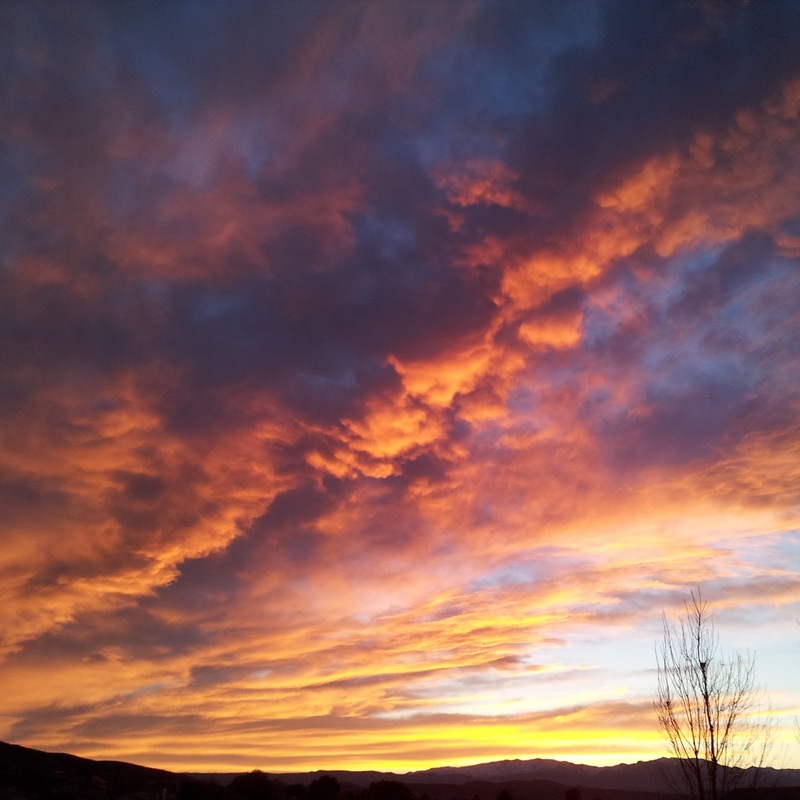 This was the sunset tonight, it was a reminder to me that everything happens in the Lord's time and not mine. Everything that I want to accomplish will happen eventually, but what is happening now is my family. So, I will be okay with only getting one or two quilts done a month - I don't need to get four done like I want to. It's my own fault that I am such a crazy, quilting detailed, perfectionist right? Which brings me to one more thing - you have to see the new lines we have in the store. 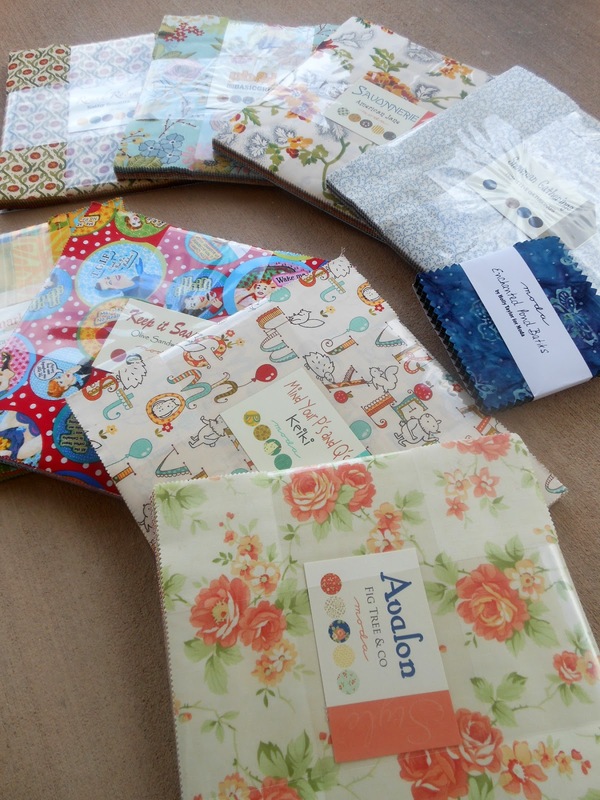 I am sure you have more time than I do right now to sew these up into some amazing quilts! I am loving PB&J right now! Thank for listening, sometimes it just takes writing down how I feel to make life so much easier. I didn't quilt when my children were young, mostly because I didn't have a dedicated space for a sewing machine, and the dining table needed to be used for...well...dining. Now I have a dedicated space and I love to quilt whenever I want. 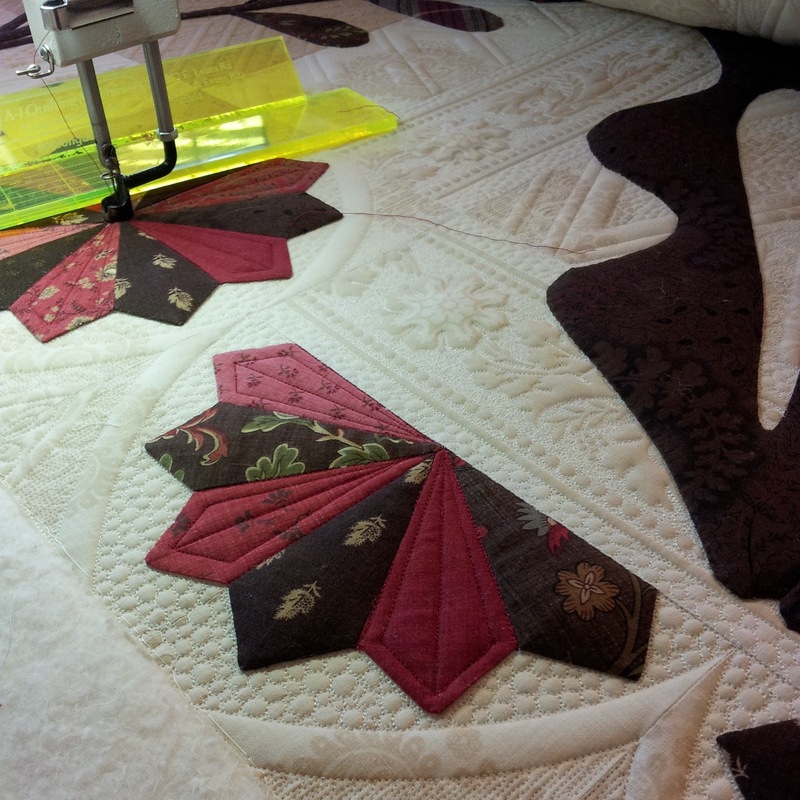 A young friend came over recently to learn how to free motion quilt. She said she would give anything to have as much time as I have to quilt. To everything there is a season, and I have learned I am most happy when I embrace the season I am in rather than wishing I were in another season. Btw, I love your blog, your quilting, and I'm hoping to get your book soon ( gotta get one boy home from a mission and the next one out on his mission first). I think Teresa just said it all! I love your post. As I look back on the days when I had young ones at home (which is quite some time ago), I know that many things came and went. But, that I tried hard to make efforts to cherish the moments while they were close...leaves warm thoughts in my memory. "...I'm rocking my babies, and babies don't keep"
Hang in there...your children will grow up before you know it, enjoy & cherish the moments now. The quilts will wait and be there when you are ready. I started quilting when I was pregnant 38 years ago and I would say until the last 10 years that I do lots of sewing now but life changed again and now our 19yr old grandson is living with us...so more time spent again doing laundry, cooking, cleaning & conversations, so enjoy your moments both with family & quilting because life goes on and do what you can....Oh yes, I love to look at all your beautiful quilts, you are a fantastic quilter. That sweet wee letter is a treasure, maybe frame it & keep it close. Remember you are human, not perfect. Great post!! How wonderful you must feel to have such a touching note from your child!! The urge to be perfect is a continuous struggle but a powerful source of wonderful achievements. As soon as you realize you keep pushing the threshold further and further and that this means you have already moved into perfection compared to the point you started from, this could put your sense of failure into an other perspective and reduce stress. From where I stand you are a perfect mother and a perfect quilter!! Such a wise little lady. You are a rich woman, having such lovely kids and the talent of your gorgeous quilting. Cherish your kids, they are young just a short while. Beautiful post. my baby is 35 but I have several things in my sewing room he wrote or made me when he was a little tyke. Wonderful memories that take me back to a time I so miss! hang in there - you can't do everything when there are small children in the house - there is just so much you can do, maybe you have unrealistic expectations of yourself, your going to wear yourself out - take time to smell the roses! My late husband used to have a saying that I have to remind myself of from time to time .... " 5 years from now will it really matter if you get it done today, or if you get it done tomorrow?" He would calmly ask me this when I would be in a frenzy over some self-imposed deadline and it would give me permission to stop for a minute and think. In 5 years WOULD it really matter? im sorry you have had a bad and your daughters letter is so sweet i myself do the same thing i just found out my neice is getting married NEXT yr and started her double wedding ring quilt for her and i feel like i have to get it done this month and while im cutting i might as well cut out her sisters after all i bought the fabric for it to so ill have to get that done ! im doing my donation quilt fot the town rafflehave to bind it UGH where does it end oh and im in the middle of painting the bdrm too ILL HAVE A CRAZY WEEK OH AND I HAVE TO GOT tO WORK TO THIS WEEK just know you are not alone we are here to listen thanks diana have a great day !! Judy you are so very lucky. You have a wonderful family and husband who obviously supports you no end. You are lucky to work at home and your kids can see the result of your motivation and persistence. I see so many young adults that have no work ethic and no direction in their lives mainly because they have no roll models. You are not failing your kids. Judi, I love this letter (mas tacks). I share everyone else's perspective -- about seasons and cherishing the young years and not forgetting what's important -- but I also strongly believe that children don't need their mother's hand or ear every minute. The time they're left to their own devices strengthens their independence and creativity. In addition, I also believe that when your children see you being productive, creative, and diligent, they're getting a positive message that will last a lifetime. Don't be too hard on yourself! On the hall wall just outside my sewing room (previously a son's bdrm) is the Eccl 3:1 quote, To everything there is a season. It is a stencil in which I used spackle instead of paint. I share the details because spackle is pretty darn permanent and I did not dare do that stencil until my youngest was on his mission. And frankly, I yearned to use spackle early on but I knew that was not going to work in my life - right then. So I waited. And it was worth the wait. I admire women who can do it all. And by "do it all" I mean 2 quilts a month. That's right. Girl, at 2 quilts a month you are a superwoman. But here is my gift to you: 1 quilt a month is SUPERwoman when you have children. Enjoy the children, adjusting your quilt expectations is a sign a SMART woman. 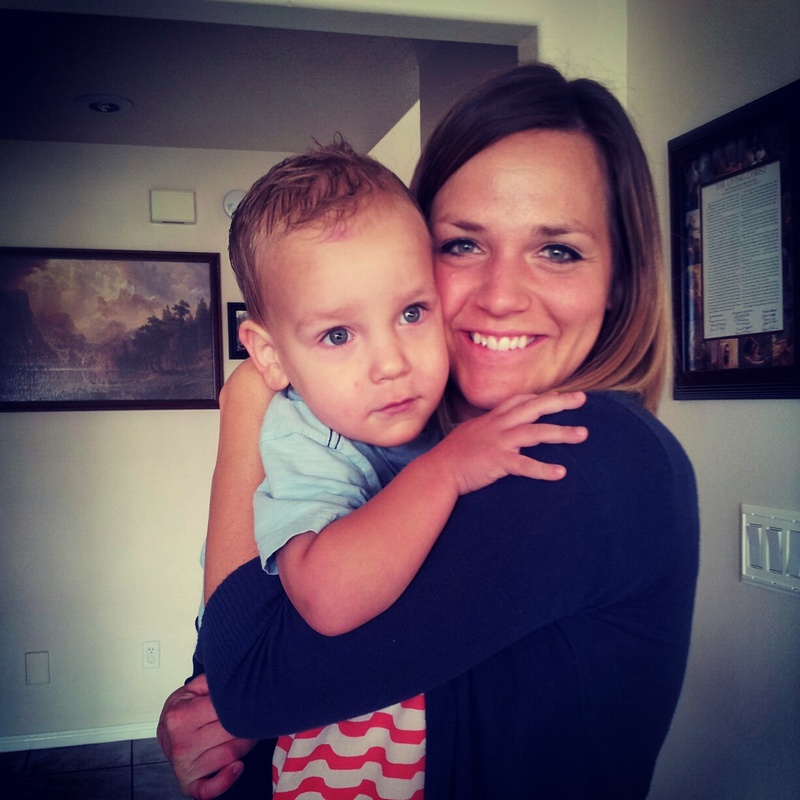 Love you and your sweet (and sometimes frustrating) blog about your life. Your talents will continue to develop WITH TIME. Time really is your friend and your childrens' friend. In the 24/7 do not squeeze too much in or there will be no joy in the minutes. Wow! Out of the mouths of babes! How very blessed you are to be recognized as the best mom in the "hole unaversaty"! Such wisdom from one so young, to know that when things get rough we just have to say our prayers! You and Clint are doing a great job with your children, as evidenced by this beautiful note from your daughter. Keep up the great work! And remember, those quilts aren't going anywhere by themselves, but your kids are! I hope you don't see this question as being nosey but...how can your customers afford quilting that takes that much time. I machine quilt, though I'm not in your league or even close. I charge $.02/sq", Even at that rate, I don't make minimum wage and my quilting is not nearly as dense as yours. I just don't get it. You either earn ridiculously little for your excellent work, or your customers pay 3-4 times the cost of the quilts materials for your quilting. Either way is crazy. Kids have a way of making us feel better and they are very wise. You are doing a great job raising them this letter shows that. What a heart-meltingly sweet note. :) Yep. You just keep giving your kids higher priority and what quilting can happen - happens. :D You're a master artist with your quilting, and that's what folks are willing to pay for - your art - even if this season of your life means very long waits. Don't ever feel bad about that. And when you're feeling antsy of your own account for getting a current project finished, just pull out that note and step back and smile. You are an amazing mother to be raising such a wise daughter. Stick to your schedule when you can and know that anyone who wants you to quilt for them is willing to wait for you to express your talents in God's time. Thanks for being so open and real. You are a true inspiration to many. Judi, I love the sweet way you communicate your feelings. Always put your family first. Our pastor said today the 2 saddest words are "if, only....". You are such a role model for so many young moms, keep up the good work - not only on the quilts, but also in your home. BTW, that quilt is looking amazing!. I have very mixed feeling. On one hand, your quilting is a business. This type of business allows you to stay in your home and work. It also allows you to stay at home with your children. What would you do if you had a job outside the home? Think about how you would balance everything. I think you scheduling looks great on paper, much like setting up a budget that doesn't work out, but things happens and you can't always control that. I love to quilt (I've learned so much from you) and I have an outside 8:00-5:00 job, a special needs 10 year old and a disabled husband, it is always hard to balance everything. You're not the only one this is happening to. I know you want to stay at home with your children, which I would love to do, and it's also important for you to quilt. Have you thought about seperating the two more? I guess one thing I'm trying to say is, I feel guilty when I'm quilting and I know I should be with my family, but then I'm with my family and all i want to do is quilt, I don't enjoy the family time. 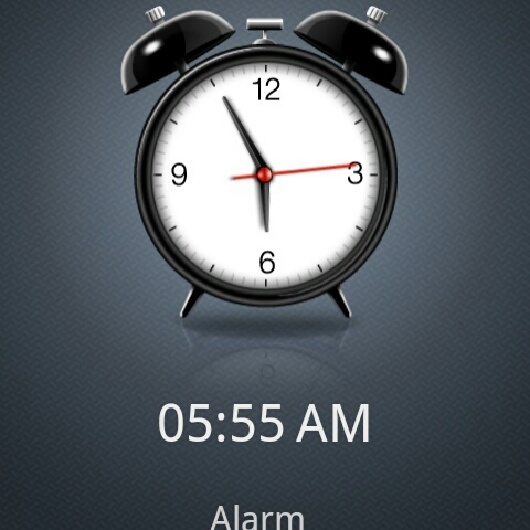 See told you I had mixed feelings...just hang in there, that little one will be boarding the school bus soon enough. I kind of do like you, I get up early on the weekends so I can quilt a couple of hours and then do family things. I have a couple of hours at night, if I'm not exhausted, to quilt. I don't ever get done what I want to get done. If you quilt to support your family then you have to give it a little more to it, if you quilt because you love it then 2 quilts a month sounds good. I'm not trying to be a Negative Nellie, I hope this comment comes off the way it was intended, I love looking at your quilting, often thinking or trying to figure out "how did she do that" or "how did she come up with that". Love to read your blog and I have learned a lot from you. Thank you. I have a lot of stress trying to balance and sounds like you do too. Judi, I think your feelings are universal to all working moms. I was a work at home mom, and something very positive that my kids remember, was that I was flexible and was there for them. What they are just now understanding is how difficult that flexibility was. Working while they are sleeping, etc. I want to encourage you to allow yourself to make the choices you need to make for you and your family. Your quilting is outstanding, and you have such talent. Your customers will understand. I am now a work at home Grand mother, watching my grandchildren as much and as often as I can, knowing that the time is short, and there will always be another quilt in my future, but my family is now. I think many of us can relate on some level, at least to the "illusive" balance! I gave up quilting all together when my kids were little because there was just no way I could do it all in the space we were in, but it wasn't my job either. For you it is a passion but also your job. I think that makes it harder. I had to really work at making my job fit into my life as a Mother. Thank God I am self employed and could make my schedule be what I needed it to be so I could take time with my kids too. But something had to give and it was sewing. However, they are older now and I have time and room to sew again. I absolutely love how you quilt. When someone wants you to quilt their project, I'm sure they would rather have you take whatever time is needed to accomplish what you do, than rush it. Just my two cents! 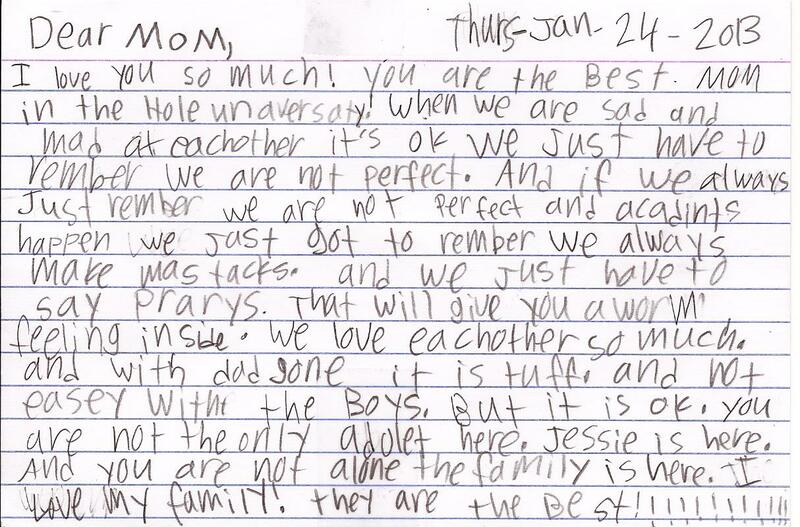 That note from your 7-year-old was just wonderful, and a true testament to what kind of children you are raising. Loved that so very much; thanks for sharing it with us. That post brought tears to my eyes! I think, like a lot of mom's, we share the same sentiment. I work from home (accountant/bookkeeper), home school my two boys, my husband is a minister, so I have church responsibilities, and I LOVE to quilt/craft. Balance is tough. Just this weekend I determined to spend less time on the computer and sewing machine while my boys are awake and more time with them. I am so project oriented that if I start something I can't seem to stop until I finish it... I am trying to learn that it is okay to do a little bit at a time and take a while to finish a project. Thanks again for the post, it was so sweet, what a darling daughter you have. I had to laugh and cry at the same time! As women, I think we are way too tough on ourselves and it's great to be reminded that everything will be ok (God uses even 7 year olds to let us know lol). I have ordered from you on several occasions and you are always super fast. As a customer, I appreciate it, but I also wouldn't care if I got my package a bit later...please, take it easy and enjoy those wonderful kids of yours! What a wise and wonderful daughter you have...life is a difficult balance. Sometimes I feel like a bad mother if I have committed too much time to a PTA activity and not too them...but then other times I feel like I do too much and need them to be more self sufficient...everyday we try our best and that is what's important. I'm sure you will treasure that note - these are the things that stay with you when things get difficult. When kids are young there is never enough time in your day, but before you know it they grow up and need you less. I think you are right to put them first, if you didn;t you would wish you had when they are older. The time you put in with them now pays off -it's obvously working when your daughter writes like this. There are times we need to be kind and understanding and patient...with ourselves! You are so blessed. Your children clearly feel the secure love of a very devouted strong family! They grow up so fast and nothing is worse than regret or guilt for things we should have done or did do and shouldn't have....the quilt can wait...the hard part is to relax and let it go (the quilt) for that time you are spending with the kids. It is so hard to balance life but you are doing a good job and have a wonderful husband that supports you in your endeavors to be a good mom and a good quilter.